Nextech believes every student should have the opportunity to learn computer science. For a student to explore computer science as a pathway in middle or high school, they must first be inspired in elementary school. Computer Science Education Week is one of Nextech’s main strategies to provide that inspirational moment, the a-ha, the “eureka!” experience for students to think of computer science as a part of their future. Established by Congress in 2009, CS Ed Week brings together teachers, students, parents, administrators, and community members to promote awareness and heighten participation computer science. At the center of CS Ed Week is Hour of Code, a grassroots movement launched in 2013 by Code.org, a leading national nonprofit dedicated to expanding participation in computer science education. 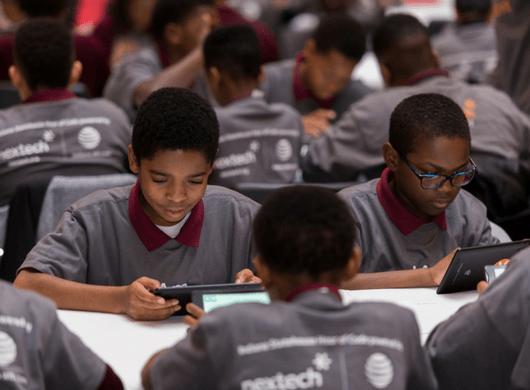 Occurring the first week in December, Nextech kicks off the celebration with a stakeholder conversation at the Indiana State House and spends the balance of the week aboard a mobile computing lab, bringing the Hour of Code to middle school students throughout Central Indiana. Nextech kicks off CS Ed Week with a powerful Hour of Code at the Indiana Statehouse. This unique event brings together hundreds of students and educators from local schools to help them learn more about CS and how much fun coding can be. The day starts with a brief conversation on CS and its relevance to everyone’s future, regardless of career desires. With the support of high school students currently enrolled in a CS course, the attendees are then lead through a series of activities that will show them that coding is not hard and boring…and can in fact be quite cool. The Nextech Mobile Computing Lab (the bus) is a full-size passenger bus that is transformed into a roving classroom for the express purpose of bringing the Hour of Code to elementary and middle school students throughout Central Indiana during CS Ed Week. The bus visits schools where groups of up to 30 students will board the bus and participate in an hourlong coding activity using Lightbot, an educational app that teaches basic coding concepts.